Are you asking yourself how to invest in stocks, which strategy is the best? Core-satellite is well established and successful investment approach. Every investor is looking for the best strategy about how to invest in stocks. 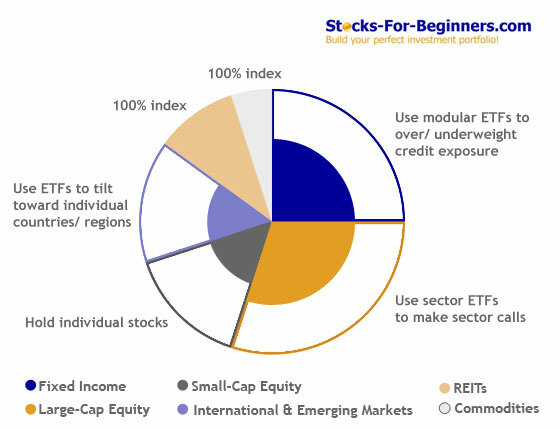 Many different investment strategies exist, some are short-term (momentum, penny stocks, following insiders, shorting, news trading, gap trading, extended hours trading), while others are mid-term and special (ETF trading, Elliott Wave, Fibonacci, contrarian) or long-term (income, value, growth). Each investment strategy has its pros and cons and many specifics, requiring special knowledge to be successful. One of the latest, established and most successful investment approaches is core-satellite strategy, which is a perfect solution and the right answer to the question about how to invest in stocks for almost any investor, regardless of his knowledge in the area of finance and investing. 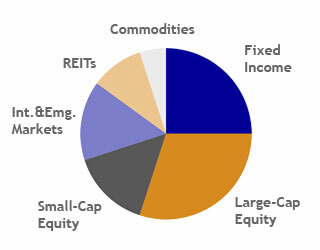 Core-satellite strategy combines "core" or diversifying asset class investments, with "satellites" that seek outperformance; it combines index and active investments across asset classes - creating a balance between a strong foundation based on diversified asset allocation and opportunities for risk-controlled, enhanced performance. Core-satellite investment approach successfully balances among three primary ingredients: the science of managing risk and return, the art associated with experience and insight, and the reality of managing emotions such as greed and fear. You can read more basics about core-satellite investment approach in special article: Build Your Stock Market Portfolio With Core-Satellite Investment Approach. Now let's look at the necessary steps of implementing a core-satellite portfolio. Risk profile analysis remains the first step in portfolio construction formulation. An investor's goals, personal situation, preferences and risk tolerance, all need to be considered to build an investor's risk profile - then matched to an appropriate asset allocation across shares, property, fixed interest, cash and other assets. By closely mirroring asset class benchmarks, index investments such as ETFs can help an investor stay broadly diversified, in line with their asset allocation, and on track to meet goals - all while lowering overall costs. Within each asset class, decisions need to be made around the proportion of "core" to be allocated to indexing and the proportion to active management or direct shares. This can be dependent on the level of risk an investor is prepared to take on, of outperformance/underperformance compared to market and the level of tax efficiency investor desires. The mix of index and active chosen may vary from sector to sector. In some asset classes where the indexing case is particularly strong (for example REITs) it may be appropriate to have 100% indexed. With the core established, seek extra return or alpha only where the risk trade-off warrants it. Use individual securities, separately managed accounts, mutual funds and even ETFs as satellites. Finally, you need to decide on an index manager for the "core" (not all index managers are the same), as well as the number of active manager "satellites" chosen to complement the core. Ideally managers selected should correlate differently to the index core. In some sectors you may require only one or two managers, in other sectors you may require more. Incorporating a diversified index fund at the "core" of a portfolio is an alternative for investors who prefer a low cost total solution without needing to constantly rebalance their portfolio. However, there is a need of rebalancing the portfolio from time to time and core-satellite approach offers a flexible solution to efficient low cost rebalancing. If active manager is underperforming the asset class benchmark, you simply rebalance by using more index investment tracking the asset class benchmark and less with the active manager. If active manager is outperforming the asset class benchmark, you simply start with a combination of index and active investments within that asset class and when it is time to rebalance, sell some of the index position.